Over the past 50 years, the nature of index investing has changed radically, as index-based funds like ETFs have taken a prominent place in portfolio management. For financial professionals and investors alike, indices serve as both templates for investment products and as yardsticks for judging active managers. In the ETF universe, there are three basic indexing choices: (1) indices that weight securities by their market capitalization or size; (2) indices that weight all securities equally; and (3) indices that weight securities using alternative factors like dividends, earnings, or a combination of factors. While this latter indexing strategy is sometimes referred to as “smart” beta, alternative beta is actually a more accurate label. The introduction of newer indexing strategies has sparked debate and controversy about the investment viability of traditional market cap weighted indexes. While the long-term performance results for traditional indexes are enviable, alternative indexes aim to improve the potential for even better returns. The S&P 500 in its present form began on March 4, 1957. It is the most widely held equity index in the U.S and one of the most popular benchmarks around the globe. The index consists of 500 large company stocks including familiar names like Apple, Exxon Mobil, Johnson & Johnson and General Electric. The S&P 500 is a market cap weighted index, which means its performance and volatility is influenced by the stock components with the largest market size while smaller companies have less effect. Although popular ETFs like the SPDR ETF (SPY) and iShares Core S&P 500 ETF (IVV) have amassed billions of dollars in investments, the S&P 500 was originally launched as a yardstick of performance rather than an investment vehicle. In the 1990s, major index providers began offering equal weighted versions of their indexes. Not long thereafter, on April 24, 2003, the Guggenheim S&P 500 Equal Weight ETF (RSP)—the industry’s first equal weight ETF—made its debut. Instead of favoring the largest stocks within the S&P 500, the equal weight index (EWI) version gives all 500 stocks an equal 0.20% weighting. “It’s designed to be size neutral” is how Standard & Poor’s describes the S&P 500 EWI’s character. What type of impact would this equal weight twist have on performance? Over the past decade, RSP has gained 143% compared to a gain of just 117.84% for SPY. Why is the margin of outperformance over the traditional S&P 500 so large? As research from Fama-French has shown, smaller stocks— which the S&P 500 EWI favors—carry higher risk with higher expected returns. What about volatility? The 10-year trailing standard deviation for the S&P 500 EWI was 17.54 compared to 14.76 for the S&P 500, according to Morningstar. Although equal weighted indexing comes with higher volatility, long-term investors have been rewarded with outperformance. Excessive portfolio turnover remains one of the key hurdles facing equal weighted indices. These types of indices need to be regularly rebalanced to counteract daily price changes of stocks in order to maintain equivalent market exposure. And that creates frictional trading costs and index tracking error. In 2014, RSP’s portfolio turnover rate was 18% of the average value of its portfolio. By comparison, VOO’s turnover rate was just 2.7% over the same period. However, the S&P 500 EWI’s turnover compares reasonably to other passive benchmarks like the S&P Mid-Cap 400 (13.5%) and the S&P Small-Cap 600 (15.6%). Furthermore, it’s not uncommon for alternative weighted indexes to have portfolio turnover that is higher versus the S&P 500 EWI. The silver lining is that RSP’s higher turnover did not negatively impact shareholders’ tax liabilities because the fund reported zero tax distributions in 2014. Whatever shortcomings in portfolio turnover that equal weighting poses are clearly being offset with the tax-efficient nature of how ETFs are structured and operate. 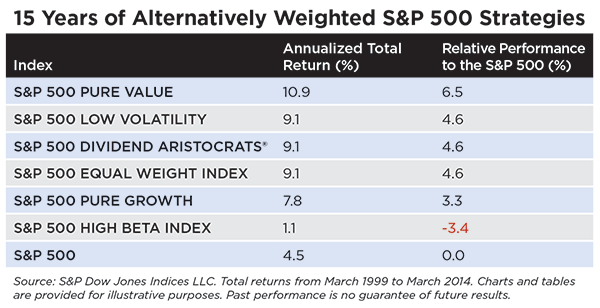 Although the S&P 500 EWI has delivered noticeable outperformance versus the S&P 500, equal weighting strategies in other equity markets haven’t been nearly as good. In foreign equities, the Guggenheim MSCI Emerging Markets ETF (EWEM) delivered a 0% return over the past three years compared to a 6.62% gain for the iShares MSCI Emerging Markets ETF (EEM). The alternatively weighted PowerShares FTSE RAFI Emerging Markets ETF (PXH) performed even worse, falling by 3.67%. It’s worth noting that emerging markets have been laggards during this period and have underperformed U.S. stocks since 2006. Disappointing performance for equal weighted ETFs in mid and small cap U.S. stocks has shown itself to be a similar trend. Both areas have outperformed large cap stocks over the past three years, yet the Guggenheim Russell 2000 Equal Weight ETF (EWRS) gained 54.45% compared to a 64% gain for the traditional market cap weighted iShares Russell 2000 ETF (IWM). In the mid cap sector, the margin of victory for the Guggenheim Russell Mid Cap Equity ETF (EWRM) was tiny compared to the SPDR S&P Mid Cap 400 ETF (MDY). EWRM gained 65.21% versus a gain of 62.81% for MDY over the past three years. Because the ETFs linked to equal weighted mid and small cap stocks have only existed a few years, it’s uncertain whether their longer-term performance will be able to match the stellar results of their equal weight large cap cousin. For advisors who decide to use equal weight ETFs in client portfolios, it’s a choice that can be characterized as “a middle of the road approach.” The equal weighting strategy has some elements of both traditional passive and alternative beta indexing. Ultimately, equal weighting exploits the weaknesses of cap weighted indices, which overweight stocks that are overpriced in the market. As a result, it’s not surprising that material outperformance by equal weighted indices has become an established historical trend.